Born in Nagoya, Hara graduated from the oil-painting department of the Tokyo University of Fine Arts and Music in 1967, and now lives in Tokyo. As with several other printmakers who emerged to prominence in the I970s, much of his work has been pristine, dispassionate and self-contained: pure, original design with no personal involvement. Hara sees only a marginal distinction between graphic design and prints; for him the goal was the final dispassionate design that existed as an original image. Hara has been working with the theme of strokes since the I970s. The strokes are paths of light, each one a range of intensities captured by Hara's magnificent technique of colour gradation. Hara prefers the screenprint and lithograph techniques for his prints because they allow him the flat coolness and perfect evenness he considers desirable. 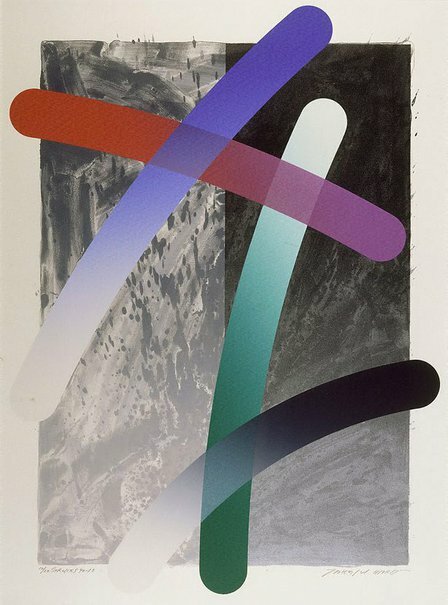 While throughout the 1970s and I980s his strokes were suspended on a blank ground, moving bands of pure light and colour, now in his recent work the strokes are fewer and contrasted against a soft, subtly expressive grey background. In such works he seems to introduce a more personal element, admitting that he wants to express the rhythm and timbre of his spirit through the strokes of his moving arm. Jackie Menzies, Contemporary Japanese Prints: The Urban Bonsai, 1992, p. 29. Signed l.r., pencil "Takeshi Hara". Not dated.